this is the green sandalwood restrung into its latest incarnation. Had to take it apart for a friend's mala. It reminds me of the malas of the Himalayan shamans and American Indian beading. I understand that HHDL found a common link in some ceremonies and dances when he visited the US. They also apparently share a love of turquoise and coral. I seem to recall it was the Hopi he visited. Nice mix of materials. You have a good eye. I love the sandle-wood. Su DongPo wrote: Nice mix of materials. You have a good eye. I love the sandle-wood. Funny you should mention that, remember when I said I had something for you? I've been making you its "sibling mala" not quite twin as it's not identical. It's the same theme of nomadic tribal. I have taken my first sandalwood mala broken it down, and started to include beads you sent me, and it's been growing into a really handsome tribal shaman-type mala. Like this one. I chose my first green sandalwood mala for you because they're much smaller beads, I didn't think you'd like a clunker like mine. And I wanted bigger beads than the first sandalwood which are about 10mm. If you like this, you'll like what I've been making. I'm extremely fond of the beads you guys (you know who you are) have sent me over time. And the Bodhiseed mala, I am restringing it again, as I've had a refined vision from its first design. It will be the the "higher octave" vibration of this mala, a ceremonial mala, you could even say it's shmancy it will be a power mala, as several important focal beads are going on it, but they haven't all revealed themselves to me yet. These things, like all important things, take practice and time. Normally, I've avoided bone as a material for malas as they carry residue karma of the being that was the bones. But that's real bone framing the real coral. This mala is to remind myself to treasure what's living and prepare for the time I have to let it all go. It will make a most precious gift when I let it go. But for now I am cherishing the practice I gain from its presence. It's a tool that serves its purpose better than ever. One day I won't need it anymore, it's theme is compassion through impermanence. It has a real balanced centered feel. I remember the Himalayas with it. Thanks for taking such interest in this hobby of mine. PS- you read my mind sometimes. It is precisely what it is. I'm still a tribal gypsy under all this fancy computer internet technology. My ways are simple. The Himalayas are still a big part of my heart. Even though I wear western clothes, there's a part of me that will always belong there. It's in my blood. Su DongPo wrote: Thank you, Ogyen! Ok, they're nice pix and stuff but, OG, do we really need megabytes of images to see how nice your stuff is? The post with the Tara mala has right around 1 meg worth of images alone. There are 3 (?) posts loaded with pix like that. I mean, really, it takes forever for these pages to load because of all those pix. Why not post your pix on photobucket or something and imbed thumbnails in your posts instead?. Not all of us have a t1. PS: I think there should be a rule about the number and size of images added to a given posting - like 250 k. Anything more is inconsiderate of the experience of others. My apologies, I have mexican DSL, and not one of these pics is uploaded to the site, they're all links to my facebook album. T1 is a distant dream where I live, the max speed is I can hope for and pay top peso for is 4 megs. Apologies, the last thing I'd want is to be inconsiderate. These imgs are copyurl and imbedded into an [img] tag. If it's such a problem, I'll remove these pictures and just post a link to the album in Facebook. As I said, they're not uploaded to the site, I don't have that kind of internet speed. Max upload speed is less than 1 meg for me. EDIT: I've removed the picture links and have left the link to the album. If you'd like to see new malas, they'll be there. I love these Nirmal. I love the one with the skulls. I've been thinking of making a skull mala for a long time, but have not had a chance to make one. Yet. When the time is ripe, I'm sure it will happen. I have bone malas and bone malas with carved skulls as well, but these hand malas have seen a lot of use. Each bead is around 1.5-2.0 cms . Not sure what the seed is, though. Incredible Yeshe. I love the carved seed. I've been thinking at some point when appropriate I will make one of these, I love the seed to bone alternative. 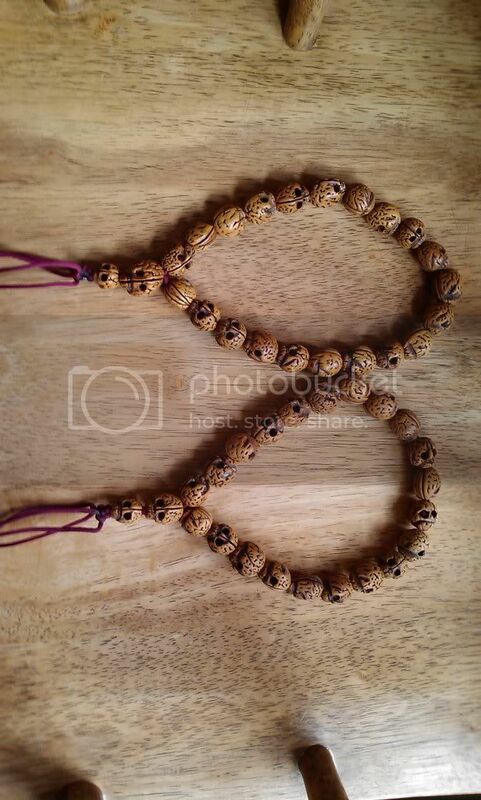 They look like carved/shaved rudraksha maybe? I suppose they could be anything tho. Got two bone malas from Nepal. Handpicked by my Vajraguru for me.Bones of an enlightened Tibetan lama. We have to be careful when picking such malas as there are many fake ones made from bones of ordinary people.The good ones are very difficult to come by these days. I have opened up one mala and made wrist malas for my very close members.I have about 15 bones left.If you want them, they are yours. Probably meant for you, I don't know. Just PM me your address and I'll post them to you that is if you are interested. For what purpose/practice did your Vajraguru pick these two mala of your's for? Typically such malas are used only by highly experienced practitioners for certain wrathfull practices under the guidance of their guru. If they are meant for use in some aspect of vajrayana practice I'm not so sure you should even show them in a photograph let alone take one apart, and give away some of the beads. Ogyen wrote: Incredible Yeshe. I love the carved seed. I've been thinking at some point when appropriate I will make one of these, I love the seed to bone alternative. They look like carved/shaved rudraksha maybe? I suppose they could be anything tho. They remind me of a walnut or peach, but I;ve not come acroiss a seed or shell with such a wonderful 'brain-like' appearance, which is the natural exterior of them. Most for sale are animal bone, especially yak or oxe. Some pretend to be from the skulls of lamas, but very few are so, and these are rarely sold. Authentic ones fetch a huge price if they are sold, but most are given within the lineage. If given to you by a lama then you are considered advanced enough in practice to handle them with due care. In your circumstances I wouls simply follow what my guru taught about the ways in which you may use them. Typically such malas are used only by highly experienced practitioners for certain wrathful practices under the guidance of their guru. If they are meant for use in some aspect of vajrayana practice I'm not so sure you should even show them in a photograph let alone take one apart, and give away some of the beads. Everything about the vajrayana is no longer secret or sacred. We wear the wrist malas everywhere we go, even to the toilet.My vajraguru was very pleased to see the malas on the wrists of some of my new members and told me that that was the reason he picked two instead of one for me.We should not have too much attachment to these little things.Once an outsider asked me why I was having skulls on my wrist. I told him that when both of us die, isn't this how we would look.It's just a reminder of death. If given to you by a lama then you are considered advanced enough in practice to handle them with due care. In your circumstances I wouls simply follow what my guru taught about the ways in which you may use them." "follow what my guru taught" Now,that's a mouthful and words of wisdom.We should always keep in that line of thought and practice.